Falling head over heels with all of life's little intricacies. Sophia Kah lace dress (I love this one too), Rossella Jardini tapestry flare jacket, S'uvimol handbag and scarf, and Alexandre Birman lace-up croco booties (samples), Maison de Coco hat, Vince Camuto ring. Shot by Isaac Lacey. Wow! 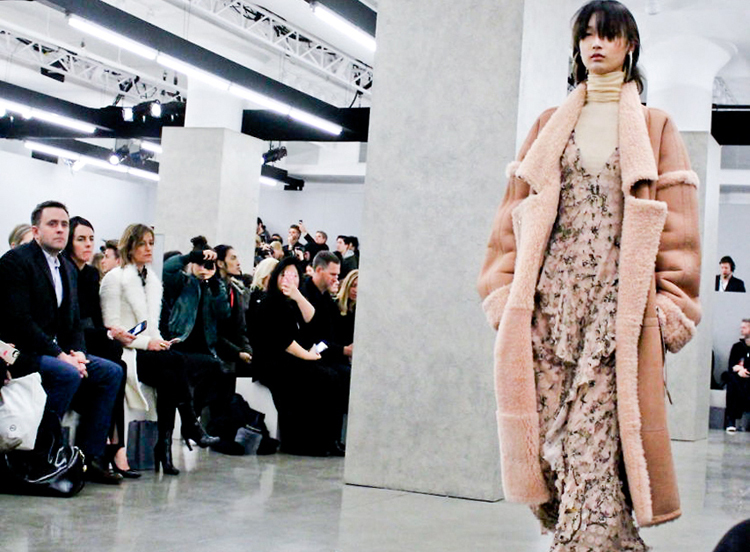 I can't believe how fast New York Fashion Week flew by. It literally came in with a blizzard and left behind dragging Spring (or at least a taste of it) in its wake. Mother Nature was all over the place. And I guess you could say that I was too. The stress of the political/ international climate as of late has definitely taken its toll, at times making me question my sanity and at others plunging me into deep despair. But, if there's one thing fashion is always good for, it's an escape. All of a sudden I was surrounded by a new kind of beauty: ethereal textures, sheer layers, playful fabrics. Throughout the week it was like the little details that brought each garment to life on the runway were slowly starting to revive my own spirit as well. I tried to carry this playfulness into dressing myself every morning, but was especially enamored by a few of the pieces I wore in my look above. The bold hue of this Sophia Kah dress, when paired with a contrasting, super-soft leather S'uvimol bag and a colorful fringed coat by former Moschino Creative Director, Rosella Jardini, kept a smile on my face all day. The compliments I got while wearing all of them didn't hurt either. If you need more ornate inspiration, below I've also included a couple favorite snaps I shot at the Zimmermann, Jill Sander and Badgley Mischka shows. I hope they make you smile, inspire you and force you to draw attention to the little things, just like they made me! From top to bottom: 1., 2. & 3. Badgley Mischka chose NYFW to debut their first ever home collection as well, which plopped the decor of your dreams into the middle of the runway as models dressed in 'sportswear' lounged during the show. 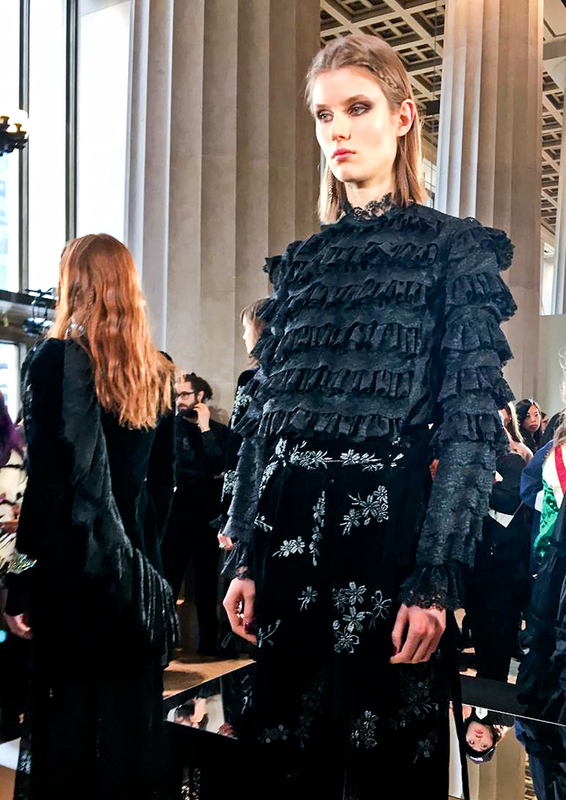 The RTW collection was as sumptuous as ever with ruffles, lace and intricate beading taking center stage. // 4. & 5. Jill Stuart's FW17 presentation presented a darker, Victorian vibe that I, for one, loved. 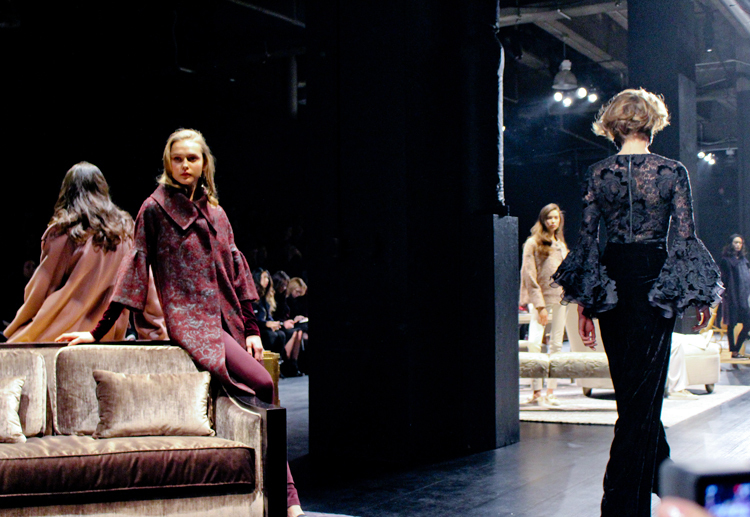 Think floor-length leather trenches, deep jewel tones and decadent fabrics galore. // 6. & 7. I've long been obsessed with Zimmermann's offerings, even wearing one of their dresses to my sister's wedding, and the FW17 collection did not disappoint. From funky and feminine boho dresses like the ones above, to disco-inspired looks, to chic suiting, this collection was a lesson in how to layer-up and still look luxe for Fall. Loved this post and your outfit!